Lindsay Condefer, of Philadelphia, holds Lentil, a French bulldog and national ambassador for canines and children with craniofacial deformities. They have not only been active in Best Friends Bash but many other activities nationally, traveling thousands of miles annually. If you take anything away from the therapeutic Best Friends Bash in Philadelphia each July, it’s simply—our face does not define us. 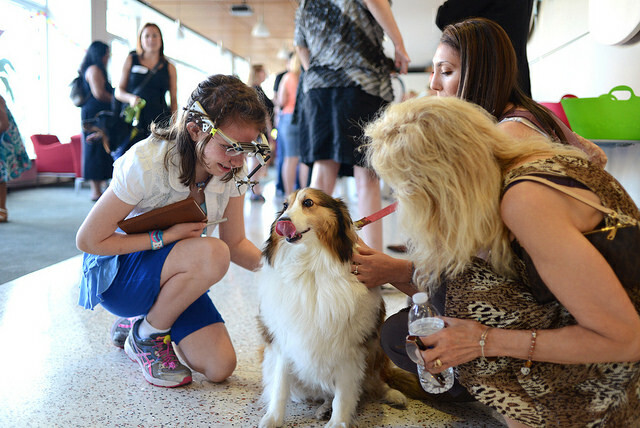 Yes, we see companies spend millions each year on print, TV and online advertising of beauty products, but after an hour or so at the Bash where human and canine craniofacial patients interact up close and personal, attendees are left inspired and in a bit of awe. 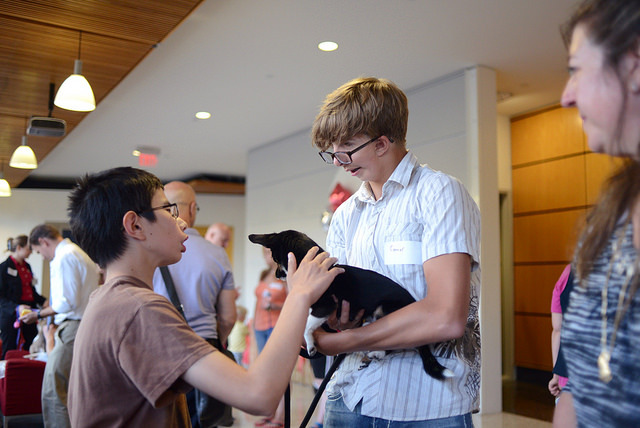 The third annual event, co-hosted by the University of Pennsylvania’s School of Veterinary Medicine and Children’s Hospital of Philadelphia, which are located only blocks apart, attracted 75-80 this year and plenty of local media attention. It was funded by a grant from Penn’s Center for Human Appearance. “The children’s true selves come out at these parties,” says Dr. Maria Soltero-Rivera, an adjunct assistant professor of dentistry and oral surgery at the school and one of the driving forces of the Bash. She has since relocated to California (veterinary specialist at VCA-San Francisco Veterinary Specialists) with the promise she will continue to play a key role in future Bashes. It creates an awareness for children with craniofacial conditions (learn from each other and correct bullying behavior). It shows that different is good, you are not alone and you are being loved (tolerate and accept each other). Demonstrates the healing aspects of therapy dogs (they don’t just judge what you look like; as long as you offer them attention, they will respond with unconditional love). 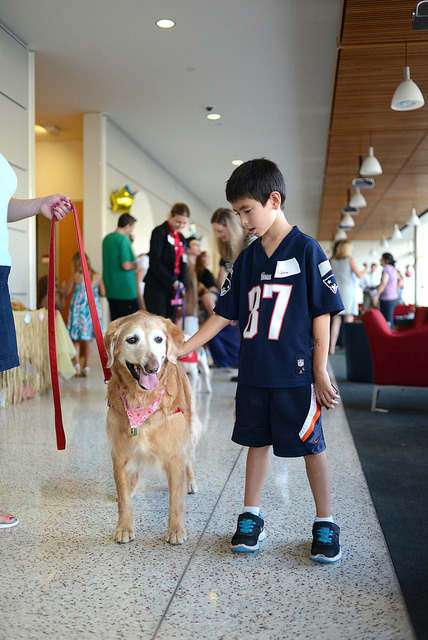 While the patients are the focus of the gathering, practitioners from both fields of medicine, parents and dog owners are key to its success. 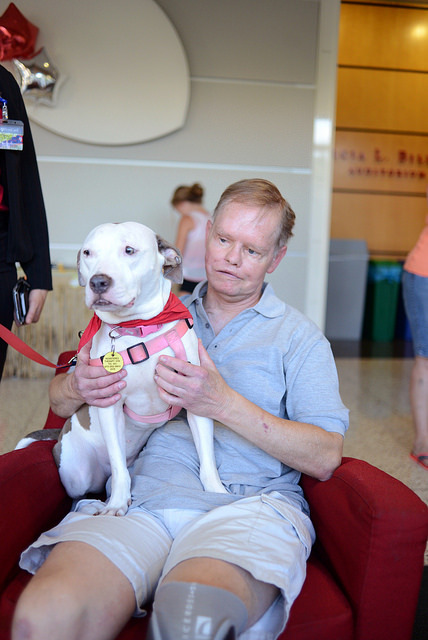 Vivian, a Staffordshire terrier mix that was named a Therapy Dog Ambassador by the National Dog Show (Philadelphia), is right at home on the lap of Andy Bartkowski. “As I stood back and watched my patients and the dogs meet at the Bash, I couldn’t help but feel that the dogs gave unspoken comfort to the children, almost as if they knew they had a common connection,” adds Diana Sweeney, CHOP parent liaison in the Division of Plastic and Reconstructive Surgery and the mother of one of the first craniofacial surgery patients at CHOP. The dogs’ owners not only love their four-legged partners but “recognize they are on a mission,” says Reiter. They have already spent for diagnostics, anesthesia, surgery, hospitalization, post-operative care and re-examinations ranging from less than $2,000 to more than $6,000. Ian Linn, left, and Connor Loescher, Children’s Hospital of Philadelphia patients, focus on Sprout, a Chihuahua who was born with a cleft nose/lip. Reiter is amazed how children bond more with certain dogs. “They obviously develop and show their preferences already at a young age. It could be that it is more the story of a dog that a child associates with then what the dog looks like. They are smart! They know so much, much more than we think. “‘Pet me’ is what the dog says, and the particular feeling of trust a child receives from a therapy dog is encouragement and offers strength. When looking at some of the dogs during these moments of interaction, I believe that they understand their role as therapists but at the same time fully enjoy the love and attention they receive from people who have been treated for same disorders as they have. Topping the memory charts for Reiter is the moment when a child reaches out to a dog, extending an arm to touch its fur. “This is what I see when I think about the Best Friends Bash,” he explains. Page Willis wears a midface distractor. She had a procedure to separate the entire lower face from the skull then gradually pull it forward to a more normal position with the device. Jasmine, a Shetland sheepdog, and Page have something in common – craniofacial surgery. The dog previously had a tumor removed. The Bash is the outgrowth of a veterinary student’s children’s booklet whose main character is a French bulldog named Lentil that was born with a cleft palate and was repaired by Reiter in May 2013. Lentil also has a cleft lip. Because the lip is more of a cosmetic surgery it is not necessary for Penn patients to undergo that procedure, explains the veterinarian. Each spring Reiter presents about 20 hours of didactic lectures for third-year students. Instead of an examination at the end of the course, he asks them to submit a creative project in the form of text, poster, audiovisual, PowerPoint presentation, game, client handout, music creation, dance, etc. Hence the Lentil booklet. 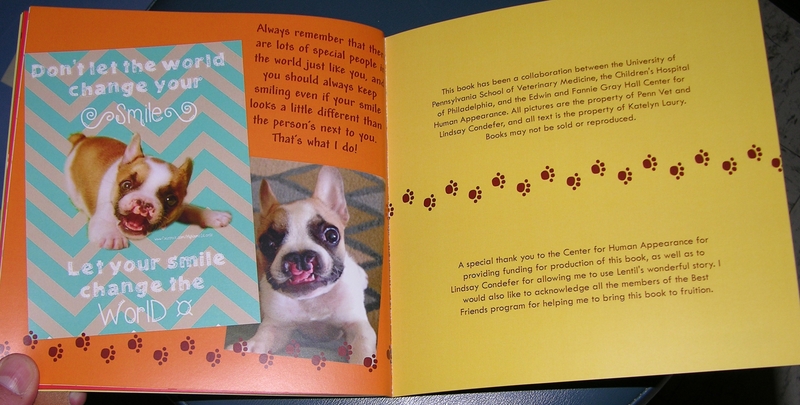 Here’s a page from a booklet about Lentil that helped launch Best Friends Bash in 2013 at the University of Pennsylvania School of Veterinary Medicine. It became such a big hit that hundreds of the booklets were printed and given to children and their families attending the first Bash in 2013, in which Lentil and his owner, Lindsay Condefer, attended. 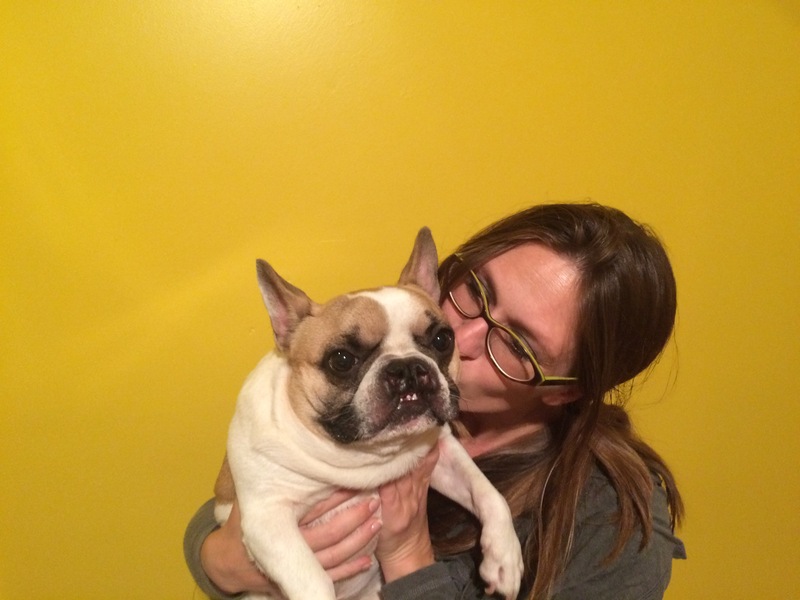 The Frenchie quickly became the “ambassodog” for children with craniofacial issues and the poster boy for the Bash. “I never dreamed Lentil would have such a positive impact on others,” says Condefer, who adopted him from a New Jersey breeder at 2 days of age and tube-fed him several times daily for four months. The only survivor from a litter of four, all with facial defects, Lentil is 2½, weighs 20 pounds and has a My Name is Lentil Facebook page following of 145,000. He did not accompany the owner to the 2015 Bash because she was in her last trimester of pregnancy and was unable to lift him. Hence, Sprout, a Chihuahua, was her date for the evening. “Lentil resembled a small hamster when he was born,” recalls Condefer, who escorts him to numerous events nationwide for the Children’s Craniofacial Association. “It’s like he was put on earth for a purpose: to make everyone around him smile and forget their own differences,” she says. Darcy, a Portuguese water dog who had craniofacial tumor removed. Emma, a golden retriever, who also had a craniofacial tumor removed. Jasmine, a Shetland sheepdog, another craniofacial tumor subject. Sprout, a Chihuahua, who was born with a cleft nose/lip. Bosco, a Rottweiler with a skull deformity who also has undergone four leg operations. Cyrus, a mixed-breed dog who was born without front legs. Rumor, a Rhodesian Ridgeback who had surgery to treat a congenital condition. Vivian, a Staffordshire terrier mix who was named a Therapy Dog Ambassador by the National Dog Show in Philadelphia. Kim Merlino, Jasmine’s owner, was moved by the children’s love at her first Bash this year. “As each child or adult would come over to us to hug and meet Jasmine, my heart melted as you could sense a connection. Andrew Linn enjoys a special moment with Emma, a golden retriever that is fully recovered from craniofacial surgery for the removal of a tumor four years ago. Emma, a 10-year-old golden retriever, came to Erin Johnson’s Reading, Penn., household at 8 weeks old. Six years later the healthy and happy golden started exhibiting signs of being uncomfortable eating and chewing her food. She even ignored bones she formerly loved and one evening Johnson detected a small lump on her upper jaw. Emma was diagnosed with an “odontgenetic squamous epithelial tumor of the right maxilla” which would continue to grow and threaten her life if left untreated but not spread to other vital organs. The tumor and one-third of her upper jaw, including both canine teeth, were removed and the lower canines were filed down so as not to impact her upper jaw. Four years later she remains tumor free, eats fine, plays with her tennis balls and enjoys a quality life. “Not only have the dogs experienced something similar to the kids, but they do not judge. Emma looks at the children and does not see their facial differences but only cares about the love (in this care petting and treats) and the child.